Four Dimensional Strategy. Michael A. G. Michaud, U.S. Department of State. Abstract: Recent U.S. Administrations have declined to commit themselves to long-term goals for the U.S. civil space program, or even to major civil space systems beyond the Space Shuttle. While the civil program has leveled off in budgetary terms, national defense space programs continue to grow. If this trend continues, U.S. activity in space will be shaped increasingly by national defense interests (the Soviet space program already is heavily influenced by defense considerations). However, there is no sign in the unclassified literature that national defense space programs are guided by a three-dimensional strategy, based on a commitment to the outward projection of presence, influence, and values (Soviet programs may have a stronger ideological base). Advocates of space humanization may have no realistic choice but to work with and try to influence national defense space programs as a way to breach the conceptual and cost barriers to the large-scale use of space. But it remains to be seen whether the U.S., the USSR, or the human species as a whole has a conception of itself in three dimensions over time. Space Industrialization: An International Perspective. Rashmi Mayur, Indian Urban Development Institute. Abstract: Space industrializaton can provide benefits in the following areas of priorities in less-industrialized countries: disaster warning, agriculture, education, communication, resource survey, medicine, new materials, and energy. The Potential Global Market in 2025 for Satellite Solar Power Stations. Alain Dupas and Maurice Claverie, French Centre National de la Recherche Scientifique. Abstract: Starting from hypothesis of moderate growth for energy demand through 2000/2025, we have computed the market of Large Electrical Power Plants(LEPP) in the range 24-40 TWh/yr suited for base-load electrical needs. For this purpose, we have developped a numerical model predicting the future demands for centralized and decentralized electrical energy according to geographical position. The input of this model are: the geographical distribution of population at the present time, the energy demand growth in the different world regions, the part of energy consumption used for electricity generation in each world region. The partition of electrical demand between centralized and decentralized needs is made according to the density of electrical consumption. We have used, as energy demand growth hypothesis, results from the reports of the Conservation Commission of the World Energy Conference (1977) and the work of the Case Western Reserve University. Our model leads to a world market for LEPP in 2020/2025 of 752/942 plants, which could be provided alternatively by Conventionnal Thermal Plants, Breeder Nuclear Reactors, Fusion Reactors or SSPS (Satellite Solar Power Station). Assuming a 50% market penetration factor for SSPS between 2000 and 2025, the number of SSPS to be built during this period amounts to 199/275. Current Space Habitat Legal Developments. Edward R. Finch Jr., Finch & Schaefler. Carbon Dioxide Electrolysis Using a Ceramic Electrolyte. Thomas E. Erstfeld and Oscar Mullins Jr., Lockheed Electronics Company, and Richard J. Williams, NASA Johnson Space Center. Excavation Costs for Lunar Materials. W. David Carrier III, Bromwell Engineering. Near-Earth Extraterrestrial Resources. David L. Kuck, Geological and Mining Consultant. Abstract: The moon and the Apollo-Amor asteroids are potential sources of near-earth extraterrestrial resources. Exploitation of these resources should be for space construction and for sale on Earth. The moon is the nearest and best understood source of iron, titanium, magnesium, calcium, aluminum, silicon, oxygen and chromium. Apollo and Amor asteroids are a potential source of iron, nickel, cobalt, magnesium, calcium, silicon, gallium, germanium, precious metals and oxygen. Space construction will consume silicon, titanium, calcium, magnesium, aluminum, iron, oxygen, nickel, cobalt and chromium. A commodity for sale on Earth must have a high unit value and or a high energy equivalent to pay for its recovery and transportation. Metals that can possibly be recovered and transported to Earth at a profit are gallium, germanium, and the precious metals from the Apollo-Amor asteroids. These metals not only have a high monetary value, they represent stored energy, for It requires energy for their recovery here on Earth. A 100 meter diameter hexahedrite iron asteroid contains 1235 tons of gallium, germanium and precious metals worth $2,911 billion. The same size nickel-rich ataxite contains 1380.7 tons of the same metals for a value of $3,008 billion. These metals will be the incentive for exploration and exploitation of the Apollo and Amor asteroids. The nickel-cobalt fraction of the nickel-rich ataxite is worth an additional $6,022 billion, in addition to an energy equivalent of 35.6 billion Kw-hr. Electrostatic Separation of Lunar Soil. I. I. Inculet, University of Western Ontario. Overview of Methods for Extraterrestrial Materials Processing. R. D. Waldron and David R. Criswell, Lunar and Planetary Institute, and Thomas E. Erstfeld, Lockheed Electronics Company. Electrochemical Preparation of Useful Materials from Ordinary Silicate Rocks [Electrochemistry of Lunar Rocks]. David J. Lindstrom and Larry A. Haskin, Washington University. Glass and Ceramics from Lunar Materials. John D. Mackenzie and Rex C. Claridge, University of California at Los Angeles. Gas Entrained Solids — A Heat Transfer Fluid for Use in Space. H. Keith Henson, Analog Precision, Inc., and K. Eric Drexler, Massachusetts Institute of Technology. Space Manufacturing and Public Policy Formulation. J. M. Logsdon, George Washington University. Education for the Era of Space Industrialization. Kerry Mark Joels, National Air and Space Museum. Abstract: Education has become a component of virtually every activity in a society with a high proportion of service careers and leisure time. Education is also a process whereby the public may be meaningfully informed about the opportunities and significance of space industrialization, and it is a market place where some of the manufactured products of space industrialization can be sold. It is challenging to contemplate how space industrialization and education will interact with each other to produce the curricula of the future. Improving the Justification for Space Industrialization. John G. Barmby, U.S. General Accounting Office. Space Manufacturing and Technocratic Centralism. J. D. Salmon, University of West Florida. Abstract: Space industry has the potential to become a centralized, technocratic, elite-controlled system with very important impact upon the concept and practice of political democracy. Opposition to SI is likely to focus heavily upon this prospect, and that opposition could delay or even prevent accomplishment of SI. Recognition of this fact should lead to implementation of measures to broaden public knowledge of and access to the SI program, and to seek methods by which actual decentralization can be made part of the program. An Analysis of the Socio-Political Status of Efforts Toward the Development of Space Manufacturing Facilities. Robert D. McWilliams, University of Mississippi. The Role of Public Interest Groups in Space Policy. Charles M. Chafer, Foundation for Public Affairs and Institute for the Social Science Study of Space. Financing Alternatives for Space Industrialization. J. Peter Vajk, Richard D. Stutzke, and Mark S. Klan, Science Applications, Inc., and Robert Salkeld and G. Harry Stine, Consultants. Economic Considerations in Space Industrialization. Robert U. Ayres, Carnegie-Mellon University, Leslie W. Ayres, Variflex Corporation, and David R. Criswell, Lunar and Planetary Institute. Abstract: The industrial categories of the United States economy are surveyed to identify those which can function using dominantly lunar raw materials or lunar derived feedstocks (LDF) and solar energy. Sixty-four standard industrial categories (SIC) appear to be compatible with LDF inputs; another 166 SIC’s might be adaptable to LDF and space industry if substitution of materials and/or terrestrial supplements were introduced. Analytic tools are presented to use in deciding optimal strategies by which a generalized economy can be developed in space in an optimal manner within given constraints of capital, products derived at a given time, local production costs, cost of import from earth and other factors. Scaling and the Start-Up Phase of Space Industrialization. David R. Criswell, Lunar and Planetary Institute. Abstract: By terrestrial standards very little mass is needed to construct the space portion of a 10,000 megawatt (10 GW) power system. Use of lunar materials makes it reasonable to consider alternatives to silicon solar cells for conversion of sunlight to electricity and thereby avoid present major problems associated with solar cell production. Machinery needed on the moon to excavate lunar materials and deliver them to a transport system, to beneficiate lunar materials, to produce glasses and ceramics from lunar materials and to chemically process lunar materials into their major oxides and elements are minor mass fractions of the total mass of equipment needed in space to produce an SPS. In addition the processing equipment can throughput several hundred times their own mass each year with very little requirement for makeup mass from earth. The Benefits of Solar Power Satellites. Peter E. Glaser, Arthur D. Little, Inc.
Abstract: It is becoming increasingly apparent that the concerns about the future supply of energy resources are real and that new approaches will have to be developed to replace nonrenewable with renewable energy sources. An SPS Reference System has been selected to meet a requirement of the SPS Concept Development and Evaluation Program Plan of Feburary 1978. The intent of the SPS Reference System is to document an SPS configuration for purposes of economic and environmental assessments and for comparisons with alternative technical approaches. The reference system does not represent an SPS configuration which is likely to be implemented but serves as an initial base for future technological developments. The SPS program holds the promise of ending the escalating energy problems which have plagued societies in recent years and that are certain to cloud future progress. All indications are that the SPS is one of the few available options which can confront the challenge of the inevitable transition to renewable sources of energy on the planet Earth. Start Up Considerations for a Space Manufacturing Enterprise. Joseph H. Engle, University of Illinois at Chicago Circle, and J. Peter Vajk, Science Applications, Inc.
Abstract: We discuss costing considerations for inclusion in planning a Space Manufacturing Enterprise. Cost Categories are: RDT&E, Procurement, Lift (of materiel and personnel to low earth orbit), Depreciation, Space Personnel, Mission Control, Administration, Interest, Inflation and Taxes. A hypothetical facility is examined. Assumed RDT&E begins in 1980, with actual Space operations beginning in 1985. Habitats and work facilities are established in Low Earth Orbit, on and near the Moon, and at a manufacturing facility in Space where ore from the Lunar Surface can be chemically processed, fabricated and combined with special components from Earth to produce Solar Power Satellites (SPS’s). Each SPS, placed in geosynchronous orbit, transmits, via microwave, 10 gigawatts of received power to suitable earth stations. Four SPS’s are built during the 1985-92 development period. The facility can then provide 2.4 SPS’s per year through the efforts of 3,096 workers in Space in the steady state. Raw costs to reach steady state are estimated at $101.6 billion (1975 dollars). The 1980 Present Value Discount Cost (exclusive of taxes and inflation) is $44.6 billion. The initial investment is recovered by 1994, and the average rate of return before taxes by the year 2000 is 7.4% per year. Optimization of Space Manufacturing Systems. David L. Akin, Massachusetts Institute of Technology. Abstract: Four separate analyses are detailed: transportation to low earth orbit, orbit-to-orbit optimization, parametric analysis of SPS logistics based on earth and lunar source locations, and an overall program option optimization implemented with linear programming. It is found that smaller vehicles are favored for earth launch, with the current space shuttle being right at optimum payload size. Fully reuseable launch vehicles represent a savings of 50% over the space shuttle; increased reliability with less maintenance could further double the savings. An optimization of orbit-to-orbit propulsion systems using lunar oxygen for propellants shows that ion propulsion is preferable by a 3:1 cost margin over a mass driver reaction engine at optimum values; however, ion engines cannot yet operate in the lower exhaust velocity range where the optimum lays, and total program costs between the two systems are ambiguous. Heavier payloads favor the use of a MDRE. A parametric model of a space manufactur-ing facility is proposed, and used to analyze recurring costs, total costs, and net present value discounted cash flows. Parameters studied include productivity, effects of discounting, materials source tradeoffs, economic viability of closed-cycle habitats, and effects of varying degrees of nonterrestrial SPS materials needed from Earth. Finally, candidate optimal scenarios are chosen, and implemented in a linear program with external constraints in order to arrive at an optimum blend of SPS production strategies in order to maximize returns. The Economics of Strikes and Revolts during Early Space Colonization: A Preliminary Analysis. Mark M. Hopkins, The Rand Corporation and Harvard University. Abstract: Strikes and revolts can have devastating consequences. In extreme cases the entire space colonization system, including the accumulated output of satellite solar power stations, can be destroyed. Fortunately, appropriate design and administrative policies can reduce the problem to manageable proportions. Overview and Outline of Mass-Driver Two. Gerard K. O’Neill and William R. Snow, Princeton University. Mass Driver Two: Cryogenic Module. Kevin Fine, Fred Williams, Peter Mongeau, and Henry H. Kolm, Massachusetts Institute of Technology. Mass Driver Alignment by Bucket Steering. Jonathan Leavitt, Princeton University. Electromagnetic Propulsion Alternatives. Henry H. Kolm, Kevin Fine, Peter Mongeau, and Fred William, Massachusetts Institute of Technology. Laser Propulsion from the Moon. Philip K. Chapman, Arthur D. Little, Inc.
Abstract: A preliminary investigation was undertaken of the potential performance of a launching laser on the lunar surface, for support of extensive lunar operations such as mining. It is found that the advantage of laser propulsion over conventional chemical propulsion for this application is not the higher specific impulse which is available, but that indigenous lunar propellants may be used. In comparison with the mass driver, laser propulsion offers larger unit payloads, simplified guidance, an initial capital investment which is almost certainly much lower, and the capability of using the system for landing on the moon as well as for launch from it. Laser-Boosted Advanced LTAV as a Heavy Launch Lift Vehicle. L. N. Myrabo, W. J. Schafer Associates, Inc.
Abstract: The purpose of this paper is to introduce a heavy lift launch vehicle (HLLV) concept proposed for the large scale transport of materials into orbit for space industrialization and colonization. The prospective payoffs for the concept are a reduction in number and cost of shuttle launches, and an enhanced payload/vehicle structural configuration. Whereas conventional rocket boost vehicles disgard the lightweight, high volume fuel tank enclosures along the launch trajectory in order to place a small volume, high-density pay-load into orbit, the HHLV concept suggested here inserts the entire primary vehicle structure into orbit. The launch vehicle design is based upon lighter-than-air-vehicle (LTAV) structures technology and innovative variable-cycle laser propulsion engines (VCLPE’s) which are attached to the vehicle ends as removable power-heads. The HLLV contains a portion of the propulsive fuel in gaseous form and flies on direct-beamed laser power from orbital solar power stations. The vehicle centersections serve as ground mass-produced construction modules for use in assembling large space structures in orbit. A catalog of ten promising propulsion systems (for use in propelling the modules into orbit) are presented in this paper. Neutral buoyancy at sea level altitudes facilitates pre-launch preparation and handling. Air-breathing pulsejet engines augmented by aerostatic, aerodynamic, and free-vortex-induced lift propell the vehicle out through the dense portion of the atmosphere. Within this flight regime, low flight velocities permit the attainment of high ratios of impulse-to-laser-power while keeping aerodynamic drag to a minimum. Two of the promising space applications for the construction modules necessitate the use of superconducting cables which are housed within the primary longeron structure. Several additional high specific impulse electrically-augmented thruster concepts suggested which incorporate the superconductors into the overall systems design to attain a positive propulsive advantage over unaug-mented rocket systems. These propulsion modes are portrayed for use in at higher flight velocities within the rarefied upper atmosphere and ionosphere where the HLLV is no longer aided by aerostatic lift. The physics of a suitable variable cycle engine, vehicle and engine performance, and laser power requirements are assessed for each of several speculative propulsive modes and vehicle sizes. The Space Shuttle External Tank as a Re-Entry Module. Stanley Kent, Aerojet Liquid Rocket Company. Abstract: The concept of re-entering the space shuttle’s external tank has received, small scale study aimed at placing estimates upon the many factors influencing the safe recovery of the external tank. This study expands the scope of previous research through the use of a computer model of the re-entry process. This model allows a quick comparison of re-entry configurations and the effect of flight path angle, lift to drag ratio, ballistic coefficient, and rotation of the tank upon stagnation point skin temperature. The results of a series of re-entry simulations support the optimistic claims of previous research, as well as providing much needed data with which to analyze the economics of re-entering the external tank. Use of a Duct-Burning Turbofan for an Earth-to-Orbit Vehicle Booster. James A. Martin, NASA Langley Research Center. Systems Integration in the Development of Controlled Ecological Life Support Systems. J. L. Carden, Georgia Institute of Technology. Nutrition, Diet and Food Processing in Controlled Environment Life Support Systems. J. Peter Clark, ITT Continental Baking Company. Abstract: The status and research requirements for the nutrition, diet and food processing components of a controlled environment life support system have recently been evaluated. The nutritional requirements for man, even in space, can be specified in terms of chemical composition rather than traditional foods. The dietary requirements are less well-known in terms of acceptability, variability and other psychological factors. Food processing requirements refer both to preservation of stored foods and processing of recycled nutrients. There are novel constraints imposed by space conditions and by various potential raw materials. The key need is for efficient means of providing the organoleptic characteristics found necessary for an acceptable and nutritional diet. Agriculture and Food Production. J. M. Phillips, Arizona Research Associates. Abstract: The human settlement and industrialization of space may be viewed as an idea whose time is coming. Controlled Ecological Life Support Systems (CELSS) must be developed if humans are to function properly during long duration missions such as will be conducted at Space Manufacturing Facilities. Food production systems for CELSS perform the crucial function of recycling wastes into usable components. Agricultural systems for Space Manufacturing Facilities will be very intensive and highly responsive to human demands and manipulations. In large space habitats with access to extraterrestrial resources, particularly carbonaceous chondritic asteroids, food production may be achieved using a wide variety of biological components. These include traditional crop and livestock species, as well as novel food sources such as aquatic plants and animals and microorganisms. To evaluate potential biological components of CELSS, research must be conducted both in the space environment and in ground-based facilities. This research effort will return significant new knowledge concerning basic biological processes as well as information on intensive food production systems. Synergistic interfaces potentially exist between terrestrial controlled environment agriculture and space industrialization activities. These include multiple-use scenarios for Solar Power Satellite rectennae facilities which are also controlled environment farms. Waste Treatment Options for Use in Closed Systems. M. L. Shuler, Cornell University. Development of Space Manufacturing Systems Concepts Utilizing Lunar Resources. E. H. Bock, General Dynamics/Convair. Lunar Resources Utilization — An Economic Assessment. Robert C. Risley, General Dynamics/ Convair. 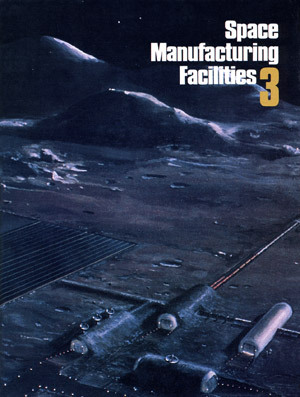 Design of a Space Manufacturing Facility to Use Lunar-Material Inputs. D. B. S. Smith, Massachusetts Institute of Technology. Abstract: The design procedure for a space manufacturing facility (SMF) is outlined, and the design of a reference SMF is described. This SMF receives 1unar material and converts them to components of large space structures, such as solar power satellites. Examples of space-specific machinery designs are presented. A costing technique is discussed, and tentative conclusions are presented. Space has some beneficial characteristics which may simplify manufacturing processes. Technology demonstration programs are needed, but prototypes of SMF equipment can be small devices. Is Lunar Material Use Practical in a Non-SPS Scenario? Gerald Driggers, Southern Research Institute. Abstract: The issue of material quantity requirements in Earth orbit which make lunar material use competitive with classical transport techniques is examined. Scenarios of future raw and finished material needs in orbit as a function of Earth-based market potential are presented. Cost of transportation from Earth and cost of a lunar-based industry to satisfy these markets are addressed and compared. An absolute minimum mass requirement and lunar materials implementation cost are not identified; however, the thresholds are shown to be between 10 and 100 times less than previously believed. The key technology needs over the next decade and possible scenarios leading to use of lunar materials in the 1990’s are discussed. New Methods for the Conversion of Solar Energy to R. F. and Laser Power. John W. Freeman, William B. Colson, and Sedgwick Simons, Rice University. High Performance Solar Sails and Related Reflecting Devices. K. Eric Drexler, Massachusetts Institute of Technology. An Environmental Assessment of the Satellite Power System Reference Design. Nathaniel F. Barr, U.S. Department of Energy. Abstract: The Department of Energy (DOE) and the National Aeronautics and Space Administration (NASA) are conducting a joint Concept Development and Evaluation Program (CDEP) which will provide by June of 1980 an improved basis for national decisions regarding Satellite Power Systems (SPS). An important element of this program is an Environmental Assessment which will identify and define environmental issues associated with the installation and operation of SPS and assess what is known, unknown, and uncertain regarding these issues. The CDEP will also provide a plan for ground based research and development activities required to further reduce uncertainties regarding potential environmental impacts. The CDEP has passed the mid-point of its schedule. Environmental issues fall into four major categories: I) potential impacts of microwave exposures on human health and ecosystems; II) other potential health and ecosystem impacts of SPS construction and operation; III) potential impacts of SPS launch and heat insertions on the atmosphere; and IV) impacts of SPS operations on electromagnetic systems and use of the radio spectrum. The status of environmental issue identification, definition, and assessment to date in each of these areas are summarized along with research and development efforts which will contribute to the June 1980 Environmental Assessment. Activities required to reduce uncertainty after June 1980 are identified and discussed. Solar Power Satellites: The Ionospheric Connection. Lewis M. Duncan and John Zinn, Los Alamos Scientific Laboratory. Abstract: This paper reviews the ionospheric effects and associated environmental impacts which may be produced during the construction and operation of a solar power satellite system. Propellant emissions from heavy lift launch vehicles are predicted to cause wide-spread ionospheric depletions in electron and ion densities. Collisional damping of the microwave power beam in the lower ionosphere will significantly enhance the local free electron temperatures. Thermal self-focusing of the power beam in the ionosphere will excite variations in the beam power flux density and create large-scale field-aligned electron density irregularities. These large-scale irregularities may also trigger the formation of small-scale plasma striations. Ionospheric modifications can lead to the development of potentially serious telecommunications and climate impacts. A comprehensive research program is being conducted to understand the physical interactions driving these ionospheric effects and to determine the scope and magnitude of the associated environmental impacts. Solar Power Satellite Beam Disturbance of the Upper Ionosphere. James E. Drummond, Power Conversion Technology. Atmospheric Attenuation of Centimeter Microwaves. W. Ziegler, Sigma Data Services Corporation at the Goddard Institute for Space Studies. Guidance, Trajectory and Capture of Lunar Materials. T. A. Heppenheimer, Center for Space Science. Optical Scanning of Mass Driver Payloads. Rainer M. Malzbender, Princeton University. Light Pressure and Solar Wind Perturbations to Payload Trajectories. B. P. Von Herzen, Princeton University. Design Opportunities — Zero Gravity Versus One Gravity Environments. Charles A. O’Donnell, M. Rosenblatt & Son, Inc.
Abstract: The weightless environment produces physical changes in man, alters his modes of perception, and presents a new interface with his physical surroundings. These changes suggest that the eventual shape and form of habitat interiors will differ from many present concepts. This paper presents selected examples of physical and perceptual changes in zero gravity and raises issues which must be incorporated into the design process to provide space habitats which will meet man’s new needs in a changed environment. It also suggests that methods must be developed to measure the qualitative effects of design on persons in confined environments. Aesthetic Considerations in Bernal Sphere Design. Marjorie L. Stuart. Abstract: The interior of a sphere is not suitable for raising children because of the variable gravity. This can be corrected by placing a cylinder inside the sphere. Concentric cylinders would more efficiently use the entire volume of the sphere. Buildings should not rest their weight on the outer shell of the sphere; instead they should be part of the structure of the sphere. The Value of Anthropology for Space Settlements. Darlene Thomas, Lock Haven State College. Abstract: This paper points out the unique aspects of anthropology and suggests the application of its perspectives, theories and methodology to space settlement. The role of the anthropologist as a trainer of settlers is discussed. Speculations are illustrated by responses having occurred in two seminars on space anthropology. The role of the anthropologist as mediator among international personnel is also examined. Spin-offs to anthropology are briefly indicated in the conclusion of the paper. Consciousness Alteration in Space. B. J. Bluth, California State University at Northridge. Abstract: Mankind’s ancient dream of living in space may soon become a reality. Permanent space settlements are being considered for a variety of specialized programs to improve the human condition. The environment of space offers the promise of limitless experimentation, and the potential to dramatically improve the quality of life. Although each extraterrestrial settlement may present a unique societal structure, a primary consideration necessarily common to all settlements will be the need for a form of limited home rule. Throughout history, philosophers have considered alternatives for community governments. These alternatives strive to attain the virtuous state, where the interests of the society and the individual are in harmonious accord with their nature. As mankind moves into space, community organization, philosophical goals and overall ensocialization will be in the control of the settlers. Thus, a space settlement may provide an appropriate forum in which to apply human ideals to reality. This study describes the existing legal and social principles that will greatly influence the establishment and life of a space settlement. Philosophical tenets are examined and applied, to develop a plausible alternative for the foundation for societal organization of a community in space. The concept of limited home rule is then examined and explained by consideration of the traditional areas of local concern that will be present in the context of the space habitat. Asteroid Prospecting and Retrieval. Brian T. O’Leary, Princeton University. Low Thrust Alteration of Asteroidal Orbits. David Justin Ross, Stanford University. Collisional Orbital Change of Asteroidal Materials. C. E. Singer, Princeton University. The Search for Asteroids in the L4 and L5 Libration Points in the Earth-Sun System. R. Scott Dunbar, Princeton University. Terrestrial, Lunar and Asteroidal Materials Costs-Impact of Advanced Earth-to-Orbit Transportation. Robert Salkeld, System Development Corporation. Abstract: Accumulation of enabling technologies indicating that uses of extraterrestrial resources will soon be feasible, has brought with it tacit acceptance among some that they are also obviously desirable as soon as possible, in view of limitations on terrestrial resources and projected requirements of large scale space activities. Indeed, use of lunar and particularly asteroidal resources appears economically attractive for certain assumed applications, because of the high costs of transporting terrestrial material to space with such launch systems as the first generation space shuttle and its potential derivatives. Even so, recent work shows that something like a lunar mining and processing operation would be economically justifiable only by a very large space project such as a system of solar power satellites, and then only with considerable uncertainty about its ultimate economic merit compared with use of terrestrial materials. Studies of advanced Earth-to-orbit transportation have begun to show the feasibility of fully reusable transporters which may be capable of airline-type operations from existing airbases thus obviating the high operational support costs apparently endemic to conventional space launch facilities and operations. If through some such approach Earth-to-space transport costs can be reduced to really low values (i.e.<1 $10/kg in orbit) then terrestrial materials are shown to be economically competitive or superior to extraterrestrial resources for a range of reasonable assumptions. Even if terrestrial materials are only roughly competitive in terms of life-cycle space system costs, the high “prices of admission” for the lunar and asteroidal options seem likely to delay their undertaking significantly in a real-world environment of limited budgets. These considerations should be explored in more depth, since comparative conclusions may differ according to various assumptions and scenarios, and because the possibility that terrestrial resources will be economically competitive or superior for some time to come, could impact fundamentally our approach to the space future. In a sense the Earth may remain “imperial” longer than some would presume.